All of our products are hand crafted fresh daily, here in Pennsylvania from our hands to yours, with the highest quality ingredients. 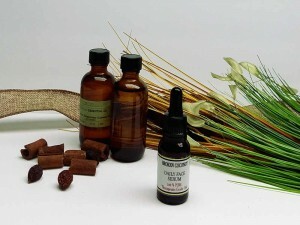 We feel natural products are not only better for your skin and health, but also better for the environment. BLUSH Ultra-fine loose powder provides sheer coverage, setting and perfecting makeup as it evens skin tone. All day comfortable for a "no make-up" look. 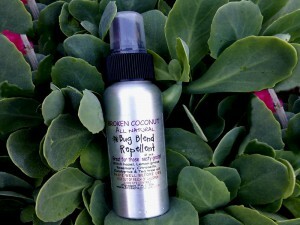 It is non-comedogenic to avoid clogging your pores. 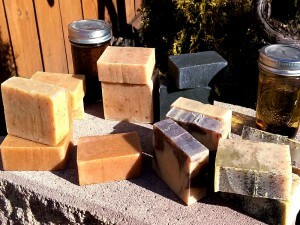 For a healthy look you can create naturally. INGREDIENTS: Sercite mica, kaolin clay, zinc oxide, titanium dioxide, iron oxides. 3 grams - $ 8.95 5 grams - $ 11.95 .25 sample - $ 2.00 CRUELTY FREE PARABE..
BRONZER Create a healthy sun-kissed look anytime with our buildable, ultra-fine loose mineral bronzer. All day comfortable for a "no make-up" look. It is non-comedogenic to avoid clogging your pores. INGREDIENTS: Sercite mica, kaolin clay, zinc oxide, titanium dioxide, iron oxides. 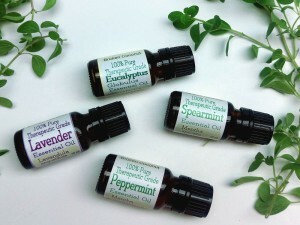 3 grams - $ 8.95 5 grams - $ 11.95 .25 sample - $ 2.00 CRUELTY FREE PARABEN FREE SYNTHETIC FRAGRA.. Create the eye enhancing look you want with our highly pigmented blends of 100% minerals. 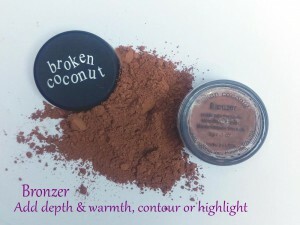 All Broken Coconut mineral makeup products are made with certified organic FDA cosmetic grade minerals. Our naturally formulated mineral makeup is better for your skin, because it is not petroleum or mineral oil-based, or contain other ingredients such as talc, corn starch, bismuth oxychloride, or dyes that can possibly block your pores and irritate your skin. Ingredients: Sericite mica, magnesium myrist..
FOUNDATION Ultra-fine loose powder provides sheer coverage, setting and perfecting makeup as it evens skin tone. All day comfortable for a "no make-up" look. 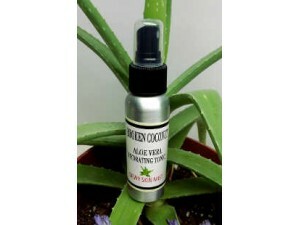 It is non-comedogenic to avoid clogging your pores. INGREDIENTS: Mica, kaolin clay, rice powder, zinc oxide, titanium dioxide & iron oxide. 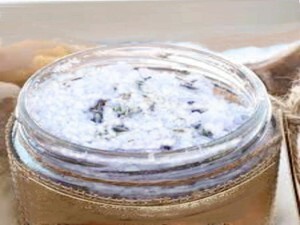 3 grams - $ 8.95 5 grams - $ 11.95 .25 sample - $ 2.00 CRUELTY FREE PARABEN FREE SYNTHETIC FRA..
A large, super-soft, face-powder brush. What it does: Perfect for depositing just the right dusting of blush or powder, leaving your face with a beautiful, airbrushed finish. Dense and extra soft, the Kabuki Pro adds a polish to all powder and pigment applications. 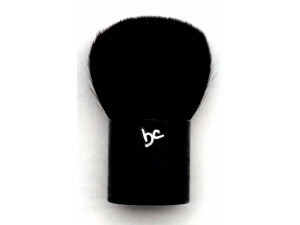 Ingredients: Goat hair bristles Dimensions: Bristles: 1 3/4” Ferrule: 1 1/2'' ..
A round, full-bodied, long handled brush for evenly applying loose powders. What it does: Perfect for creating an even, matte finish, this brush is designed for easy application to achieve naturally beautiful results. Ingredients: Goat hair bristles Dimensions: Bristles: 1 1/2” Ferrule: 2” Handle: 4 1/2” ..
A small soft, angled brush for facial contours that provides expert definition. 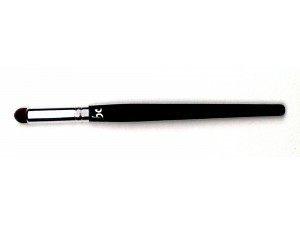 What it does: This defining brush is ideal for touch up or applying eye shadow resulting in a truly sculpted appeal. Ingredients: Goat hair bristles Dimensions: Bristles: 7/16” Ferrule: 1 1/2'' Handle: 5” ..
A dome-shaped brush that distributes color perfectly. 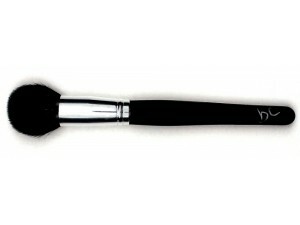 What it does: This versitle brush can be used to optimize every stroke for ideal makeup application. It promises an even clean finish every time. 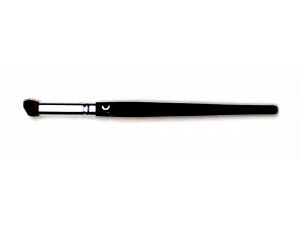 Ingredients: Goat hair bristles Dimensions: Bristles: 5/16” Ferrule: 1 1/2” Handle: 5” ..